Zhou, J., Ouyang, J., Zhang, M., and Yu, H. (2014). "Simultaneous saccharification and fermentation of bagasse sulfite pulp to lactic acid by Bacillus coagulans CC17," BioRes. 9(2), 2609-2620. Lignocellulosic biomass is an economical and renewable feedstock for microbial production of bulk chemicals such as lactic acid. In many cases, simultaneous saccharification and fermentation (SSF) can achieve lower cost and higher productivity than the classical double step fermentation. Thus, in the present study, bagasse sulfite pulp was directly employed to produce lactic acid by SSF, using thermophilic Bacillus coagulans strain CC17. The effects of various factors, including CaCO3 addition time and the initial buffered pH, on lactate production were investigated. It was found that Bacillus coagulans strain CC17 could perform well at conditions that are also optimal for fungal cellulase. The addition of CaCO3 as the buffering reagent is critical for the production of lactic acid and maintaining pH. Maximum production of lactic acid was obtained by adding CaCO3 after 3 h fermentation. When pH 7 was used as the initial pH, strain CC17 produced about 20.68 g/L lactic acid from 20 g/L cellulose content of BSP with 15 FPU of Cellulast 1.5L/g cellulose and 15 CBU of Novozyme 188 /g cellulose. The results showed that this strain has potential to be used for direct lactic acid fermentation from lignocellulosic biomass via SSF. Lactic acid, one of the most important industrial chemicals, is widely used in food, pharmaceutical, leather, cosmetic, textile, and other industries (Datta and Henry 2006; Gao et al. 2011). Food and food-related applications account for approximately 85% of the demand for lactic acid, whereas the nonfood industrial applications account for only 15% of the demand (John et al. 2009). Recently, lactic acids has drawn wide attention for the production of biodegradable and biocompatible polylactate polymers, and as an environment-friendly alternative to conventional non-biodegradable plastics made from petrochemicals. This interest is driving a current market expansion for lactic acid (Huang et al. 2005; Marques et al. 2008; Abdel-Rahman et al. 2011). There are two natural pure isomers of lactic acid, D- and L-lactic acid. Since elevated levels of the D-isomer are harmful to humans, L-lactic acid is the preferred isomer in the food and pharmaceutical industries (Huang et al. 2005; Gao et al. 2012). Lactic acid production can be achieved either by chemical synthesis routes or fermentative production routes. Presently 90% of all lactic acid produced worldwide comes from the fermentative production route (Zhang et al. 2007). The fermentative production route can be used to obtain pure L-lactic acid by choosing an appropriate strain, whereas the chemical synthesis production route always results in a racemic mixture of DL-lactic acid (Hofvendahl and Hahn-Hägerdal 2000; John et al. 2006). The widely used substrates for lactic acid production are food crops such as potato starch, corn starch, and wheat starch. However, the use of low-cost non-food materials for lactic acid production appears to be more attractive because they do not have any impact on the human food chain. They also contribute to economic, social, and security benefits at the national and local levels (Abdel-Rahman et al. 2011; Singh et al. 2008). Lignocellulosic resources are generally considered to represent an attractive and inexpensive raw material for the production of lactic acid, as they are renewable, widely distributed, abundant, and cheap (John et al. 2007; Wee et al. 2006). The process using lignocellulosic materials includes four main processes: pretreatment, enzymatic hydrolysis, fermentation, and separation (Linde et al. 2007). However, the process using cellulosic-based material is complicated. First, cellulose is a persistent polymer, and its degradation requires expensive and complicated pretreatments and multi-enzymatic reactions (Okano et al. 2010; Budhavaram and Fan 2009; Zhang et al. 2013). Second, the efficiency of the enzymatic hydrolysis is not high due to the strong inhibition by glucose and cellobiose, and thus large amounts of enzymes are required, which are very expensive (Ou et al. 2011). Third, the hydrolysate of cellulosic material contains five-carbon sugars and six-carbon sugars, both of which need to be efficiently converted to lactic acid (Budhavaram and Fan 2009). Thus, developing an efficient process for hydrolysis of lignocellulose into sugars and fermentation of all available sugars to lactic acid could potentially decrease the cost of lactic acid production process (Suriyachai et al. 2013). The simultaneous saccharification and fermentation (SSF) process combines the enzymatic hydrolysis step and the fermentation step (Lee et al. 2013). It has been widely used in ethanol production and gradually applied in the production of lactic acid. It requires less investment and a lower level of enzyme loading because the fermentation step helps reduce end product inhibition from the cellobiose and glucose formed during enzymatic hydrolysis (Kang et al. 2012; Watanabe et al. 2012; Karki et al. 2011). It also can accelerate processing time, save equipment investment, reduce the production cost, and increase productivity. The simultaneous saccharification and co-fermentation (SSCF) process based on SSF can both ferment five-carbon and six-carbon sugars (Sreenath et al. 2001). Temperature and pH play an important role in affecting the activity and cell growth. The main disadvantage of SSF and SSCF lies in different temperature optima for saccharification (46 to 50 oC) and fermentation (37 to 43 oC) (Hari Krishna et al. 2001; Zhang et al. 2013). To achieve great efficiency in both SSF and SSCF, it is desirable to establish conditions optimal for two biocatalysts: cellulases and the microorganism (Patel et al. 2006; Wooley et al. 1999). Recently, Bacillus coagulans strains have attracted much attention owing to their strong ability to ferment both hexose and pentose sugars to optically pure L-lactic acid using the pentose phosphate pathway with a theoretical yield of 100% (Patel et al. 2006; Ye et al. 2013; Ouyang et al. 2012). In addition, B. coagulans is moderately thermophilic and capable of fermenting at 50 to 55 oC, which reduces the risk of microbial contamination, specialized equipment requirements, and high energy consumption (Abdel-Banat et al. 2010; Ouyang et al. 2013b). The present study deals with the utilization of bagasse sulfite pulp (BSP) as an alternative substrate for lactic acid production, using the B. coagulans strain CC-17. It is confirmed to grow and ferment well at 50 oC. Recent studies showed that sulfite pretreatment could enable robust performance during the hydrolysis process (Ouyang et al. 2013a). Compared to other cellulosic material, paper sludge has unique advantages, such as there is no need for costly pretreatment, negative feedstock cost, and potential integration into the current infrastructure (Budhavaram and Fan 2009; Fan et al. 2003; Lynd et al. 2001). The aim of this study is to investigate the influences of CaCO3, citric acid, initial pH, and cellulose concentration on SSF. Bagasse sulfite pulp (BSP) was kindly provided by Jiangmen Sugar Cane Chemical Co., Ltd (Jiangmen, China). The material was washed 10-fold with distilled water (w/w) for the removal of inhibitors and sulfite groups, filtered, stored in sealed plastic bags at 4 oC upon arrival, and used unaltered (Ouyang et al. 2013a). The BSP was found to consist of 73.30% cellulose, 15.45% hemicellulose, and 6.15% lignin. The B. coagulans strain CC-17, obtained from Nanjing Forestry University, was used in this work. The cultures were stored at -80 oC, and a fresh batch was prepared for each experiment. Cellulase was purchased from Sigma Aldrich, produced by Novozymes. Yeast extract was purchased from Sigma Aldrich. Others were purchased from Sinopharm Chemical Reagent Co., Ltd. The pre-culture medium consisted of (g/L): glucose 20; corn syrup powder 2.5; yeast extract 1; NH4Cl 1; MgSO4 0.2; CaCO3 10, and distilled water. The initial pH was 7.2. The medium for SSF was comprised of the following components (g/L): cellulose 20, corn steep powder 0.892, yeast extract 1.978, FeSO4·7H2O 0.03, MnSO4·H2O 0.03, and CaCO3 10. A 250 mL flask containing 80 mL pre-culture medium was incubated on a rotary shaker at 50 oC, 150 rpm for 12 h. SSF reaction mixtures contained substrate, cellulase, 10% (v/v) culture inoculums and SSF basal medium to make up the volume to 100 mL. The pH was adjusted to 4.8 with 0.05 M citrate buffer. Reactions were carried out on a rotary shaker at 50 oC, 150 rpm. The enzyme loading is 15 FPIU/g of cellulose for all the experiments. The concentrations of sugars and organic acids in the samples were determined with a high performance liquid chromatography system (HPLC, Agilent technology 1200 series, Germany) equipped with a Bio-Rad Aminex HPX-87H column (300 × 7.8 mm) and a refractive index detector (Ouyang et al. 2013b). The mobile phase was 5 mmol/L sulfuric acid solution at a flow rate of 0.6 mL/min. The column temperature was maintained at 55 oC. Samples were filtered through 0.22-μm syringe filters to injection. where Ccel, Cglu, and Cxyl are the final volumetric concentration of cellobiose, glucose, and xylose, respectively, obtained from enzymatic hydrolysis (g/L), 0.05 is the total volume, 0.9 is the conversion of cellulose to glucose, 1.05 is the conversion of cellobiose to glucose, G is the dry weight of BSP (g), W1 and W2 are the cellulose and hemicellulose content of BSP, respectively, Ct is the lactic acid concentration at time (t) (g/L), Ci is the initial lactic acid concentration (g/L), and t is fermentation time (h). Equation 1 can also represent glucose yield when the value of Ccel is zero. Enzymatic hydrolysis of 20, 40, and 60 g/L cellulose content of BSP was carried out with two commercial enzyme preparations (15 FPU of Cellulast 1.5L/g cellulose and 15 CBU of Novozyme 188 /g cellulose) to evaluate the possibility of using BSP as the carbon source for lactic acid fermentation. The BSP hydrolysate was obtained after 48 h, 72 h, and 96 h, respectively, under 50 oC and 150 rpm (rotary shaker) with 0.05 M sodium citrate buffer (pH 4.8). Glucose concentration exhibited an upward trend during the whole enzymatic hydrolysis process, and the initial glucose accumulation rates increased from 1.42 to 3.58 g/(Lh) as the initial cellulose concentration was varied from 20 to 60 g/L in the first 6 h (Fig. 1). 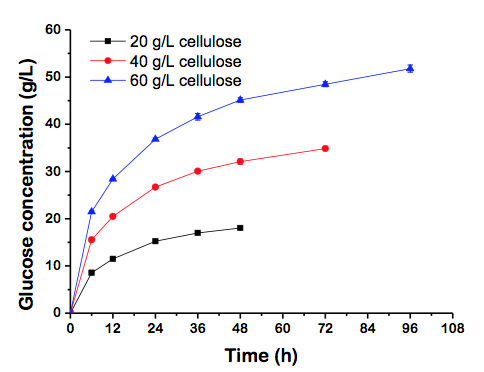 Cellobiose accumulated in the first 12 h and then quickly became hydrolyzed by β-glucosidase (data not shown). The final concentrations of xylose were 3.48, 6.72, and 10.04 g/L, respectively (Table 1). Cellulast 1.5L is a complex enzyme system that contains highly active xylanase. Thus, there was no need to add additional xylanase during enzymatic hydrolysis process. And the cellulose conversion of 20, 40, 60 g/L BSP reached 81.13%, 78.41%, and 77.69%, respectively (Table 1). The cellulose content rose 40 g/L along with a 3.44% decrease of cellulose conversion. The glucose and xylose yields (81.16% and 72.27%) were comparable to those reported by Silva and his coworkers for sugarcane bagasse. The glucose and xylose yields were 49.3% and 36.7% for WDM-treated bagasse, and 78.7% and 72.1% for BM-treated bagasse (Silva et al. 2010). Hence, it was found that BSP has higher enzymatic hydrolysis efficiency compared with bagasse, which makes it a highly favored raw material compared with other cellulosic materials. In this investigation BSP was used as carbon source with the initial concentration of 20 g/L since this gave its highest cellulose conversion. However, it appears that additional basic study is needed to more fully understand what happens under low concentration conditions. B. coagulans strains have been well known for their strong ability for using both hexose and pentose sugars as the carbon sources to produce optically pure L-lactic acid (ee 99.6%). (Patel et al. 2006). In order to evaluate its ability to convert hexose and pentose to lactic acid, preliminary fermentation of 20 g/L reagent-grade glucose, xylose and cellobiose were carried out in shake-flasks. The initial pH and temperature were adjusted to 4.8 (0.05 M citrate buffer) and 50 oC with the addition of 10 g/L CaCO3as the neutralizing agent. The parameters measured in this experiment were sugar consumption and lactic acid production. Glucose was rapidly consumed in 12 h, while xylose consumption exhibited a delay at the beginning of fermentation. This phenomenon was also evident in Wang’s study. It may be due to an initial lack of related enzymes. Therefore there is a lag time before the enzymes required for assimilation appear when cells are exposed to xylose (Wang et al. 2010). All sugars were consumed within less than 24 h, and all retained a minor amount of unused sugars. After 48 h of fermentation the lactic acid yield of glucose, xylose, and cellobiose fermented were 86.64%, 70.85%, and 84.07%, respectively (Fig. 2). These results implied that this strain has a good fermentation performance under enzymatic hydrolysis condition. Our observations indicated that this strain could directly metabolize cellobiose so that it may have the potential to reduce the cost of SSF by minimizing the amount of fungal cellulases, a significant cost component in the use of biomass as a renewable resource (Marques et al. 2008). Its ability to completely assimilate xylose with a high lactic acid production favored its use over other lactic acid bacteria (Ouyang et al. 2012). All these findings demonstrated that the B. coagulans strain CC-17 has huge potential in SSF and especially in SSCF. CaCO3 is a commonly used reagent to neutralize lactic acid during fermentation. Its low solubility in water makes it possible to neutralize lactic acid and maintain the pH at a certain level automatically (Huang et al. 2005). In this paper, CaCO3 was added at different times with a dosage of 10 g/L. An experiment of no CaCO3 addition was carried out by setting up an initial pH at 4.8 using 0.05 M sodium citrate buffer. The pH during fermentation was measured by pH test paper. As shown in Fig. 3, a very low concentration of about 2.53 g/L lactic acid was produced during the experiment in which there was no CaCO3 addition; the low results were attributed to the drop of pH to near 4. Glucose and xylose concentrations showed upward trends during SSF, which indicated that it has little effect on enzymatic hydrolysis. Little assimilation of sugars and low lactic acid concentration showed that the strain neither grew well nor worked well at pH close to 4 (Budhavaram and Fan 2009). It was confirmed that the presence of CaCO3 as a buffering reagent is necessary for SSF of lactic acid in the absence of active pH control. The CaCO3 was added at 0 h, 3 h, and 6 h fermentation in this study under the same conditions of 150 rpm, 50 oC for 48 h. The pH could be maintained at around 5.5 by the addition of CaCO3. Many other references had reported its high efficiency to maintain pH during fermentation (Huang et al. 2005; Marques et al. 2008). The maximum lactic acid concentration of 18.26 g/L was produced for the experiment with the addition of CaCO3 at 3 h fermentation in about 30 h, which was 4% higher than 0 h addition and 10.27% higher than 6 h addition. Therefore, 3 h may be the optimum CaCO3 addition time for maintaining a growth pH to achieve a high lactic acid production using BSP as the substrate. It was found that citric acid concentration decreased after adding CaCO3 along with sugar consumption during fermentation except for the experiment in which no CaCO3 was added. The consumption of citric acid may have an impact on SSF, and further experiments were carried out to study this aspect. The investigation of the influence of sodium citrate consumption in the SSF process was conducted in flask fermentation using distilled water and 0.05 M citrate buffer to make up the final volume to 100 mL. Experiments were carried out at the same conditions of 50 oC and 150 rpm on a rotary shaker. The pH of the experiment with distilled water was adjusted to 4.8 by using 72% H2SO4 to match the same pH as with the citrate buffer. An experiment of no pH control was carried out with the initial pH measured as 5.67. The lactic acid was produced at a rate of 1.13 g/(Lh) along with the consumption of citric acid. After 12 h of fermentation, lactic acid was produced at a slower rate 0.362 g/(Lh) during 12 h to 24 h and then reached the maximum concentration of 17.96 g/L in 24 hours (Fig. 4). Citric acid concentration decreased from 8.78 to 1.04 g/L. Experiments with distilled water and no pH control exhibited nearly the same variation trend, and could get the maximum lactic acid concentration of 17.76 and 17.84 g/L in 48 h. The glucose and xylose concentration changed at a similar rate for all experiments. The results showed that the consumption of citric acid did not increase the production of lactic acid and had little effect on enzymatic hydrolysis. So it was decided to carry out SSF experiments without citrate buffer. And adjustment of the initial pH was found to have little influence of lactic acid production. Experiments need to be carried out to evaluate the influence of different initial pH. To investigate the impact of initial pH on SSF, the initial pH was adjusted to 4.0, 5.0, 6.0, and 7.0 by adding 72% H2SO4 or 50% NaOH. All experiments started with an initial cellulose concentration of 20 g/L under the conditions of 50 oC and 150 rpm for 48 h. A dosage of 10 g/L calcium carbonate was added at 3 h fermentation. And the pH was measured by universal indicator paper during SSF. The results showed that after 9 h fermentation, the pH was stabilized around 5.5 for all experiments. Lactic acid production corresponding to an initial pH of 7 was at a higher rate than others during 0 h and 12 h about 0.92 g/(Lh) and then at a slightly lower rate close to others after. From Fig. 5 it can be seen that four experiments showed similar sugar consumption trends. It is possible that the initial pH had little effect on the enzymatic hydrolysis process due to the fast degradation of substrate at low concentration. Xylose was found to be totally consumed when the initial pH was 7, but other initial pH experiments in this study showed accumulations after 48 h fermentation. This result means that the strain converted sugars to lactic acid more efficiently at pH 7, which is near its optimal pH value of 7.2 based on previous studies (Ouyang et al. 2013b). The highest final concentration of about 20.68 g/L lactic acid was produced at pH 7 within 48 h fermentation. The maximum lactic acid was based on the total concentration of glucose and xylose is 0.77 g/g. To date, production of lactic acid from various renewable low-cost lignocellulosic materials has gained much attention. Cui et al used 30 g/L NaOH-treated corn stover for lactic acid SSF and obtained 21.0 g/L lactic acid (Cui et al. 2011). Rice bran was used as substrate in Tanaka’s study, where 28 g/L lactic acid was obtained from 100 g/L substrate (Tanaka et al. 2006). The use of cellulosic biosludge as substrate for lactic acid SSF was investigated, and a product yield of 37.8 g lactic acid per 100 g biosludges was obtained after 48 h of fermentation (Romaní et al. 2008). In comparison with these renewable substrates, a higher lactic acid yield was obtained from BSP, demonstrating its feasibility as a raw material for L-lactic acid production. Most that reported lactic acid production from renewable biomass used Lactobacillus strains. Recently, several Bacillus sp. strains had been isolated for lactic acid SSF. Compared with other Bacillus sp. strains, a relatively better result was obtained in this study. Budhavaram et al. obtained 21.1 g/L lactic acid after 140 h fermentation using strain 36D1 in batch fermentation. Additionally, Maas and his coworkers used B. coagulans DSM 2314 to ferment polymeric material and obtained a final lactic acid concentration of 40.7 g/L, which accounted for 43% (w/w) of the theoretical yield (Budhavaram et al. 2009; Maas et al. 2008). All these prove that B. coagulans CC-17 is a promising strain in lactic acid SSF from lignocellulosic materials. Bacillus coagulans strain CC-17 was used to convert the sugars in bagasse sulfite pulp to lactic acid and found to perform well at 50 oC in SSF mode. Its ability to convert glucose, xylose, and cellobiose into lactic acid makes it a promising strain for lactic acid SSF. BSP was directly used as the carbon source, and it resulted in a good enzymatic hydrolysis performance within the range of 20 to 60 g/L cellulose content. Results of SSF experiments indicate that the addition of CaCO3 as the buffering reagent is critical for the production of lactic acid and maintaining pH. Maximum production of lactic acid was obtained by adding CaCO3 at 3 h fermentation. The consumption of citric acid had little impact on enzymatic hydrolysis and lactic acid production. And the initial pH 7 was found to get the maximum lactic acid production of 20.68 g/L. This study was supported by the National Natural Science Foundation of China (31200443), Program for New Century Excellent Talents in University (NCET-11-0988), and Excellent Youth Foundation of Jiangsu Province of China (BK2012038). The authors are grateful to the National Hi-Tech Research and Development Program of China (2012AA022301), PAPD for partial funding of this study, and Open Project of State Key Laboratory of Pulp and Paper Engineering of South China University of Technology (201335). The authors are also grateful to the kind support from the Committee of the 4thConference on Biorefinery towards Bioenergy (ICBB2013) in Xiamen, China. Abdel-Banat, B. M. A., Hoshida, H., Ano, A., Nonklang, S., and Akada, R. (2010). “High-temperature fermentation: How can processes for ethanol production at high temperatures become superior to the traditional process using mesophilic yeast,” Applied Microbiology Biotechnology 85, 861-867. Abdel-Rahman, M. A., Tashiro, Y., and Sonomoto, K. (2011). “Lactic acid production from lignocellulose-derived sugars using lactic acid bacteria: Over view and limits,” Journal of Biotechnology 156, 286-301. Budhavaram, N. K., and Fan, Z. (2009). “Production of lactic acid from paper sludge using acid-tolerant, thermophilic Bacillus coagulans strains,” Bioresource Technology 100, 5966-5972. Cui, F., Li, Y., and Wan, C. (2011). “Lactic acid production from corn stover using mixed cultures ofLactobacillus rhamnosus and Lactobacillus brevis,” Bioresource Technology 102, 1831-1836. Datta, R., and Henry, M. (2006). “Lactic acid: Recent advances in products, processes and technologies—A review,” Journal of Chemical Technology Biotechnology 81, 1119-1129. Fan, Z., South, C., Lyford, K., Munsie, J., Van Walsum, P., and Lynd, L. R. (2003). “Conversion of paper sludge to ethanol in a semicontinuous solids-fed reactor,” Bioprocess Biosystems Engineering 26, 93-101. Gao, C., Ma, C. Q., and Xu, P. (2011). “Biotechnological routes based on lactic acid production from biomass,” Biotechnology Advances 29, 930-939. Gao, T., Wong, Y., Ng, C., and Ho, K. (2012). “L-lactic acid production by Bacillus subtilis MUR1,” Bioresource Technology 121, 105-110. Hari Krishna, S., Janardhan Reddy, T., and Chowdary, G. V. (2001). “Simultaneous saccharification and fermentation of lignocellulosic wastes to ethanol using a thermotolerant yeast,” Bioresource Technology 77, 193-196. Hofvendahl, K., and Hahn-Hägerdal, B. (2000). “Factors affecting the fermentative lactic acid production from renewable resources,” Enzyme and Microbial Technology 26, 87-107. Huang, L. P., Jin, B., Lant, P., and Zhou, J. T. (2005). “Simultaneous saccharification and fermentation of potato starch wastewater to lactic acid by Rhizopus oryzae and Rhizopus arrhizus,” Biochemical Engineering Journal 23, 265-276. John, R. P., Nampoothiri, K. M., and Pandey, A. (2006). “Simultaneous saccharification and fermentation of cassava bagasse for L-(+)-Lactic acid production using Lactobacilli,” Applied Microbiology Biotechnology 134, 263-272. John, R. P., Nampoothiri, K. M., and Pandey, A. (2007). “Fermentative production of lactic acid from biomass: An overview on process developments and future perspectives,” Applied Microbiology Biotechnology 74, 524-534. John, R. P., Anisha, G. S., Nampoothiri, K. M., and Pandey, A. (2009). “Direct lactic acid fermentation: Focus on simultaneous saccharification and lactic acid production,” Biotechnology Advances 27, 145-152. Karki, B., Rijal, B., and Pryor, S. (2011). “Simultaneous saccharification and fermentation of aqueous ammonia pretreated oat straw for ethanol production,” Biological Engineering 4, 157-166. Kang, H. W., Kim, Y., Kim, S. W., and Choi, G. W. (2012). “Cellulosic ethanol production on temperature-shift simultaneous saccharification and fermentation using the thermostable yeast Kluyveromyces marxianus CHY1612,” Bioprocess Biosystems Engineering 35, 115-122. Lee, J. Y., Li, P., Lee, J., Ryu, H. J., and Oh, K. K. (2013). “Ethanol production from Saccharina japonica using an optimized extremely low acid pretreatment followed by simultaneous saccharification and fermentation,” Bioresource Technology 127, 119-125. Linde, M., Galbe, M., and Zacchi, G. (2007). “Simultaneous saccharification and fermentation of steam-pretreated barley straw at low enzyme loadings and low yeast concentration,” Enzyme and Microbial Technology 40, 1100-1107. Lynd, L. R., Lyford, K., South, C. R., Van Walsum, G. P., and Levenson, K. (2001). “Evaluation of paper sludges for amenability to enzymatic hydrolysis and conversion to ethanol,” Tappi Journal 84, 50. Marques, S., Santos, J. A. L., Gírio, F. M., and Carlos Roseiro, J. (2008). “Lactic acid production from recycled paper sludge by simultaneous saccharification and fermentation,” Biochemical Engineering Journal 41, 210-216. Maas, R. H. W., Bakker, R. R., Jansen, M. L. A., Visser, D., Jong, E. D., Eggink, G., and Weusthuis, R. A. (2008). “Lactic acid production from lime-treated wheat straw by Bacillus coagulans: neutralization of acid by fed-batch addition of alkaline substrate,” Applied Microbiology Biotechnology 78, 751-758. Okano, K., Tanaka, T., Ogino, C., Fukuda, H., and Kondo, A. (2010). “Biotechnological production of enantiomeric pure lactic acid from renewable resources: Recent achievements, perspectives, and limits,” Applied Microbiology Biotechnology 85, 413-423. Ou, M. S., Ingram, L. O., and Shanmugam, K. T. (2011). “L(+)-Lactic acid production from non-food carbohydrates by thermotolerant Bacillus coagulans,” Journal of Industrial Microbiology & Biotechnology 38, 599-605. Ouyang, J., Cai, C., Chen, H., and Jiang, T. (2012). “Efficient non-sterilized fermentation of biomass-derived xylose to lactic acid by a thermotolerent Bacillus coagulans NL01,” Applied Microbiology Biotechnology 168, 2387-2397. Ouyang, J., Liu, B., Zhang, M., Zheng, Z., and Yu, H. (2013a). “Enzymatic hydrolysis, adsorption, and recycling during hydrolysis of bagasse sulfite pulp,” Bioresource Technology 146, 288-293. Ouyang, J., Ma, R., Zheng, Z., Cai, C., Zhang, M., and Jiang, T. (2013b). “Open fermentation production of L-lactic acid by Bacillus sp. strain NL01 using lignocellulosic hydrolyzates as low-cost raw material,” Bioresource Technology 135, 475-480. Patel, M. A., Ou, M. S., Harbrucker, R., Aldrich, H. C., Buszko, M. L., Ingram, L. O., and Shanmugam, K. T. (2006). “Isolation and characterization of acid-tolerant, thermophilic bacteria for effective fermentation of biomass-derived sugars to lactic acid,” Applied Environmental Microbiology72, 3228-3235. Romaní, A., Yáñez, R., Garrote, G., and Alonso, J. L. (2008). “SSF production of lactic acid from cellulosic biosludges,” Bioresource Technology 99, 4247-4254. Silva, A. S. A., Inoue, H., Endo, T., Yano, S., and Bon, E. P. S. (2010). “Milling pretreatment of sugarcane bagasse and straw for enzymatic hydrolysis and ethanol fermentation,” Bioresource Technology 101, 7402-7409. Singh, J., Panesar, B. S., and Sharma, S. K. (2008). “Energy potential through agricultural biomass using geographical information system—A case study of Punjab,” Biomass and Bioenergy 32, 301-307. Sreenath, H. K., Moldes, A. B., Koegel, R. G., and Straub, R. J. (2001). “Lactic acid production by simultaneous saccharification and fermentation of alfalfa fiber,” Journal of Bioscience and Bioengineering 92, 518-523. Suriyachai, N., Weerasaia, K., Laosiripojana, N., and Champreda, V. (2013). “Optimized simultaneous saccharification and co-fermentation of rice straw for ethanol production by Saccharomyces cerevisiaeand Scheffersomyces stipitis co-culture using design of experiments,” Bioresource Technology 142, 171-178. Tanaka, T., Hoshina, M., Tanabe, S., Sakai, K., Ohtsubo, S., and Taniguchi, M. (2006). “Production of D-lactic acid from defatted rice bran by simultaneous saccharification and fermentation,” Bioresource Technology 97, 211-7. Watanabe, I., Miyata, N., Ando, A., Shiroma, R., Tokuyasu, K., and Nakamura, T. (2012). “Ethanol production by repeated-batch simultaneous saccharification and fermentation (SSF) of alkali-treated rice straw using immobilized Saccharomyces cerevisiae cells,” Bioresource Technology 123, 695-698. Wee, Y. J., Kim, J. N., and Ryu, H. W. (2006a). “Biotechnological production of lactic acid and its recent applications,” Food Technology and Biotechnology 44, 163-172. 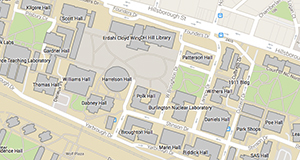 Ye, L. D., Zhou, X. D., Hudari, M. S. B., Li, Z., and Wu, J. C. (2013). “Highly efficient production of L-lactic acid from xylose by newly isolated Bacillus coagulans C106,” Bioresource Technology 132, 38-44. Zhang, M., Ouyang, J., Liu, B., Yu, H., Jiang, T., Cai, C., and Li, X. (2013). “Comparison of hydrolysis efficiency and enzyme adsorption of three different cellulosic materials in the presence of poly(ethylene glycol),” Bioenergy Research 6, 1252-1259. Zhang, W., Lin, Y., Zhang, Q., Wang, X., Wu, D., and Kong, H. (2013). “Optimisation of simultaneous saccharification and fermentation of wheat straw for ethanol production,” Fuel 112, 331-337. Zhang, Z. Y., Jin, B., and Kelly, J. M. (2007). “Production of lactic acid from renewable materials by Rhizopus fungi,” Biochemical Engineering Journal 35, 251-263. Article submitted: January 16, 2014; Peer review completed: February 16, 2014; Revised version received and accepted: March 14, 2014; Published: March 24, 2014.